In perspective, Indonesia rarely bothers to notice earthquakes under Richter 7.5 in magnitude. Partly, that is because Indonesia has so many powerful earthquakes they are a bit jaded. After all, a Richter 8.5 is ten times more powerful than a 7.5. And Richter 7.5 is about the minimum to generate a tsunami. 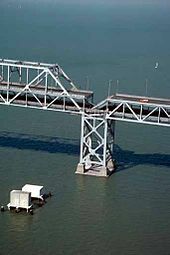 In 1989 the Richter 6.9 Loma Prieta earthquake rocked the San Francisco Bay Area and caused a great deal of damage: 63 deaths; almost 4000 injuries; and likely six (6) billion dollars in property losses. 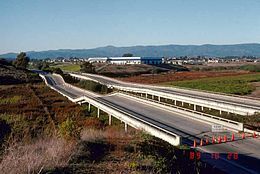 Below left, the collapsed Cypress Freeway near Oakland. Below center, part of the cantilever span of the Bay Bridge (note the collapsed upper roadbed angled at 45 degrees downward in the center) . Below right Loma Prieta Peak itself is barely visible on the horizon in the background. In the foreground are collapsed sections of State Highway 1 near Watsonville. We were filming near Coyote Point in San Mateo south of San Francisco airport when I noticed a skunk out of the corner of my eye. Offense was out of the question. 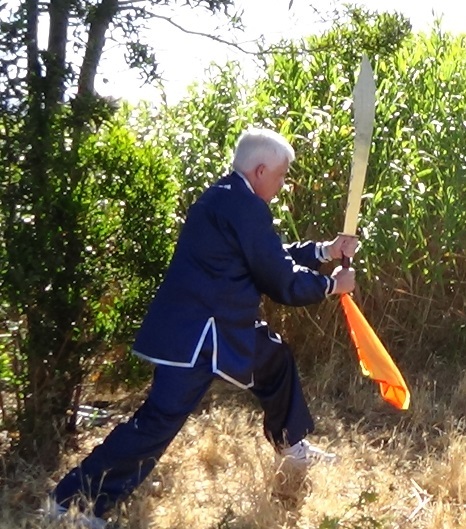 Maybe a Grandmaster could use Wave Hands Like Clouds and not get sprayed, but I felt we had no defense. While it would have been good manners to offer some fine tea to the skunk, we had no hot water. Plus, I am not sure skunks like tea. cloud of liquid droplets at least five meters. It is hard on the eyes and skin (feels like you are burning) and you smell terrible for days, so a very effective defense. I am pretty sure silks would be ruined.